In 1973, two years after the William Street United Methodist Church was destroyed by fire, the current church building (pictured) was constructed and dedicated at 28 W. William St. Out front of the church on the corner of West William and North Franklin streets is a historical marker stating the corner property was once the childhood family home of Rutherford B. Hayes, who went on to become the 19th president of the United States. “William Street Church Burns” read the black bold headline at the top of the front page of the Monday evening edition of The Delaware Gazette on Feb. 1, 1971. Under the headline was a photograph of the historic building’s skeletal frame encased in ice after the fire had been extinguished. 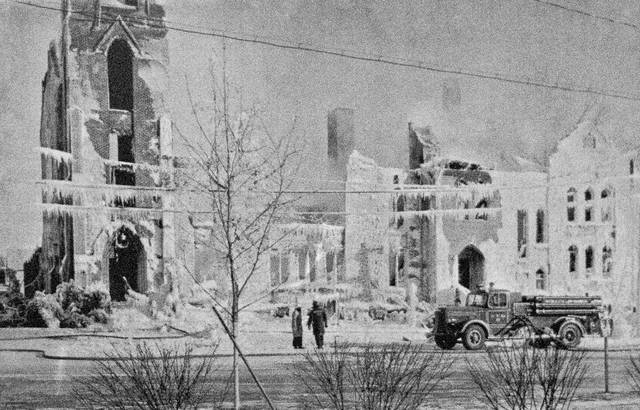 “Historic William Street United Methodist Church was an ice-coated shell today—all that remained after the Saturday night fire that crept through the 83-year-old landmark before it was discovered shortly before 11:30 p.m. Church spokesmen estimated the loss at $400,000 to $450,000,” the article states. The article also notes that Art Ruth, a staff member of The Gazette and a Tri-Township fireman, reported the fire after he smelled burning wood as he left The Gazette building that night. 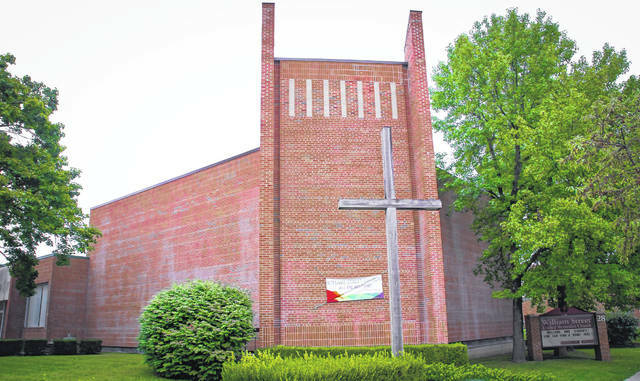 The William Street United Methodist Church, like The Gazette, is celebrating its bicentennial this year. According to Jack Hilborn, owner of Hilborn Insurance in downtown Delaware and William Street UMC historian, the church started in 1818 when some early Methodists formed a “class meeting.” In 1824, the first church building was built and dedicated on the corner of William and Franklin streets. He said that the founding father of Delaware, Moses Byxbe, was also an early member of the church. Hilborn said in the early 1840s, the church received its “first permanent pastor, Adam Poe,” who envisioned founding a Methodist College in Delaware. He said Poe solicited $10,000 in funds to purchase the Mansion House Hotel. The building became Ohio Wesleyan University, which was founded in 1824. Hilborn added he vividly remembers the night the William Street UMC caught fire in 1971. “I was a senior at The Ohio State University home for the weekend in Delaware,” he said. Hilborn said the phone rang and his father picked it up. Hilborn said as he and his father walked out of the house, “We could see a big orange glow over Delaware.” He said they stood on the opposite corner where the Masonic Temple is and watched the church burn. Hilborn said he recalls it being 10 degrees below zero that night as 16 fire departments answered the call of the largest fire that Delaware has ever seen. He said the hot, burning embers were tossed into the air and traveled west to the east with the wind to the rooftops of other buildings. Firemen climbed and stood guard on the top of those buildings ready to extinguish the embers before they could ignite the roof. Hilborn said on the following Sunday, Delaware City Schools allowed the William Street Methodist congregation to hold services in the nearby auditorium at Willis. Hilborn said it was a very solemn service. Two years later in 1973, the current William Street UMC building was constructed and dedicated. Out front of the church building is a historical marker stating the corner property was once the childhood family home of Rutherford B. Hayes, who went on to become the 19th president of the United States. Hilborn said the congregation kicked off its bicentennial celebration the fall of 2017 with a concert from the Band of the Western Reserve headed by Keith Wilkinson, a birthday bash, and visit from Chaplin Jon Powers portraying Poe, historical tidbits in the church bulletin, and a historical message from Robert Tannehill, the former dean of the Methodist Theological School. Hilborn said the planned activities for the remainder of the year include a visit by Bishop Gregory Palmer of the West Ohio Conference of the United Methodist Church on Oct. 7, the dedication of a plaque in front of the church on the corner of Franklin and William streets, and a special musical by the church Musical Director Brian Hesselbart and church member Ann Burkam, a former music instructor in the Buckeye Valley Local School District. Hilborn said the commemorative events were organized by a special committee that includes himself, Keith Wilkinson, Ann and Jeff Burkam, Doug Warnock, Bob Tannehill, Myra Rund, Laurie Schaefer, Gail Toluene, Mike Brechbuhler, Roger Higgins and Pastor Julie Carmean. The William Street UMC remains a comforting and nurturing place for all of God’s people in need, Hilborn added. According to Hilborn, the church is an incubator for new ministries like the Common Ground Free Store, Step Program, Bridges Out of Poverty, Weekend Helper (provides free lunches to school children) and WS2 (tutoring program held at the Willis Education Center). Hilborn listed the more traditional community ministries the church continues to be involved with as Wednesday Meals, Alcoholics Anonymous, Scout troop activities, sponsorship and support of refugee families, and global ministries that include support of former United Methodist missionaries, Walt and Sue Henry, in Bolivia and Rev. Paul Webster, who currently serves in Zambia. Church members, Hilborn added, work with community partners Ohio Wesleyan University and Andrews House. This entry was tagged 1971 fire, D. Anthony Botkin, Delaware Gazette, Jack Hilborn, Rutherford B. Hayes, William Street Methodist Church. Bookmark the permalink.